One of the priority goals for Omaha Public Schools for the 2018-2019 school year is mathematics. Each month, district and building leaders are learning about how to support this priority goal. In August, the math team shared about Growth Mindset in math, and in September they shared about Productive Struggle in math. These two topics are also important when students are working with library, inquiry, and technology skills. In this newsletter, you will find some general information about Growth Mindset and Productive Struggle. Please take some time to look through these resources and consider how the information can inform your teaching practice. ClassDojo and Stanford's PERTS Research Center teamed up to create the the first season of The Mojo Show. The five-episode video series (along with a few incredible activities) highlight the power of having a growth mindset, and how any student can learn this skill! For a teacher, it’s pretty easy to focus on improving students—that’s our job, right? So when I learned about Carol Dweck’s theory of growth mindset, my first thought was about how I could get my students onboard with this idea. And then I realized that if I were to better my own craft, I would have to take on the challenge for myself as well. Teachers Need a Growth Mindset Too Pushing our students to adopt a growth mindset is an easy call. Adopting one ourselves is harder. Mathematics is not solely about getting the right answers—it’s about the process as well. Productive struggle is developing strong habits of mind, such as perseverance and thinking flexibly, instead of simply seeking the correct solution. Not knowing how to solve a problem at the outset should be expected. The key is working through a problem, encouraging students to think outside the box, and not letting them get discouraged if their initial strategies don’t work. In this paragraph, replace "mathematics" with "inquiry." 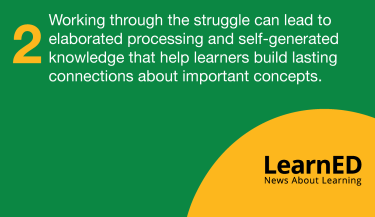 Think about how productive struggle is important for your students when they are engaging with our inquiry framework, information resources, and product creation. Again, replace math with inquiry. Click on the picture to be taken to the original source. The problem with praise such as “you’re so clever” or “you must be so talented” is that it doesn’t tell students what they need to do next time. 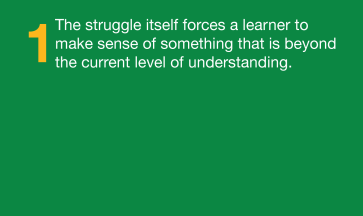 It’s also worth being aware of the ways in which the idea of growth mindset is sometimes misunderstood. In the rush to embrace it as a method, the message has sometimes been diluted to “growth mindset is all about effort” or morphed into “anyone can do anything” – neither of which is accurate or helpful. Having a growth mindset is about the belief that someone can learn and improve. To help shape students’ behaviours and mindsets, teachers should look to develop a consistent culture of high expectations and quality feedback. Stanford professor and leading researcher Carol S. Dweck discusses mindsets and how beliefs about intelligence affect learning outcomes. According to her, there are two fundamental mindsets that a student can have about intelligence: it is fixed, or it is fluid and can increase with practice and training. These two mindsets strongly affect students’ perception of their intelligence as well as achievement. Dweck believes addressing mindsets is a central area in which educators can work to close the achievement gap. Growth mindset is a vital piece of Inflexion’s work around the Four Keys to College and Career Readiness, and we think an important part of what makes students prepared and empowered for their own path after high school; in college, career, and life. At its core, an “inquiry mindset” is about openness—an openness to explore, think, learn, create, share, and grow. Over the past few years, the concept of a 'Growth Mindset' has become increasingly popular. Discovered by Carol Dweck, Professor of Psychology at Stanford University, growth mindset is the idea that our intelligence isn't fixed. Dweck found that students who believe they can develop their basic abilities and improve themselves have greater motivation and higher achievement than those who see their abilities as fixed and unchangeable. In her TED TALK, Dr Dweck explains a study where children were taught that, as they push to the edge of their comfort zone, their brains can form new stronger neural connections. Her studies showed significantly improved achievements in a wide range of age groups and settings, particularly disadvantaged students. Does it have value in the classroom? Despite its popularity, the concept has recently been criticized. Efforts to replicate Dweck's work in the classroom have not worked because, according to Dweck, you can't actually 'teach' growth mindset, it's more subtle than that. Dweck insists that it is about showing pupils what to think, rather than simply telling them. So is there value in teaching the concept of growth mindset at all? Growth mindset may not need to be taught explicitly, but children of all ages can benefit from being taught the language of meta-cognition, which allows them to be aware of their own thoughts and of how they make decisions about their own learning and effort. Can teachers benefit from adopting it too? In short, yes. Some people even argue that it is the key to successful PD, because PD should be approached with the same attributes of a growth mindset; with hard work, a focus on improving and embracing failing as a chance to learn. Others, however, believe that it is more nuanced and not something you can just adopt. It needs to be embraced culturally in a school, rather than just by individuals. 1. Tell yourself you can do it – Your internal dialogue has a great effect on how you think about things. Giving yourself reasons and excuses as to why you can’t do something are attributes of a fixed mindset. Believing in yourself and thinking that you can are attitudes of a growth mindset. 2. Realize you have a choice – Acknowledge that it is up to you whether you have a fixed or growth mindset. Having a growth mindset means you have the ability to realize that you can improve if you want to, and that whether you improve or not is up to you. 3. Choose difficult tasks – Putting yourself out there and forcing yourself out of your comfort zone means that you’ll either succeed in an area you thought you might struggle in, or you’ll learn from the experience. Having a growth mindset means you would be happy with either outcome; as you’d recognize that both are ways of improving. 4. Seek new learning opportunities – Actively seeking to try out new practices and ideas means that you are taking control of your own professional learning. Discussing both successes and failures with like-minded colleagues means you can help each other improve.